Sweet Wall - a centre of excellence! Since Charles Louis MacKean started breeding flat racehorses in the 1920's Sweet Wall Stud has been used to sustain the particular equine interest of its various owners. So, from Irish 2000 Guineas winners through top National Hunt horses to Eventers and Connemara Ponies a wealth of experience has been built up. Now, with the fourth generation, Lucca Stubington, coming through, the emphasis has turned slightly away from fullscale breeding back to competition. Find out more about Lucca and her exploits by clicking on her page on the left. Sweet Wall, however, is unchanged in maintaining high standards in all aspects of horse management, and we look forward to assisting you to achieve your goals too. 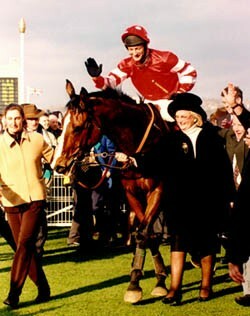 Florida Pearl, bred by Sweet Wall, being led in after winning the Weatherbys Champion Bumper at the Cheltenham National Hunt Festival 1997.